Aetheria’s Daemon is what some might call a non-traditional fantasy novel. It takes place on a world with a landscape and ecology much different from Earth, where all the humans (or at least they think of themselves as human) are immortal, and any object can be conjured from the air with a thought. 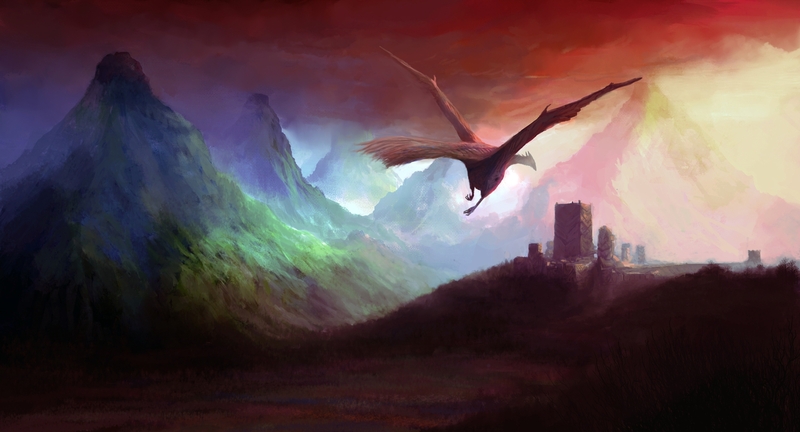 The elements shown here–the castle, the mountains, the drakenbird and even the dust clouds in the distance are all important elements in the story, but you’ll have to wait to read it to find out what they mean. What I can tell you about the story is that it begins with Meli, a practitioner of the arts of plant and animal creation. Meli has had a dream in which she is holding a baby, something no one in Aetheria has heard of before. Drawn by a powerful urge to make her vision real, she recruits Ariden, an unsociable vagabond and legendary fighter, and Karis, an aged airship engineer with the appearance of a teen girl, to help make a perilous journey across the ocean. But when an attack by air pirates splits the companions and leads Meli and Ariden to the lair of an ancient cult, they begin to learn the truth of her quest, and its connection with a mysterious being who plots the destruction of all Aetherian life. You can see more of Eren’s work in his CGHub gallery.